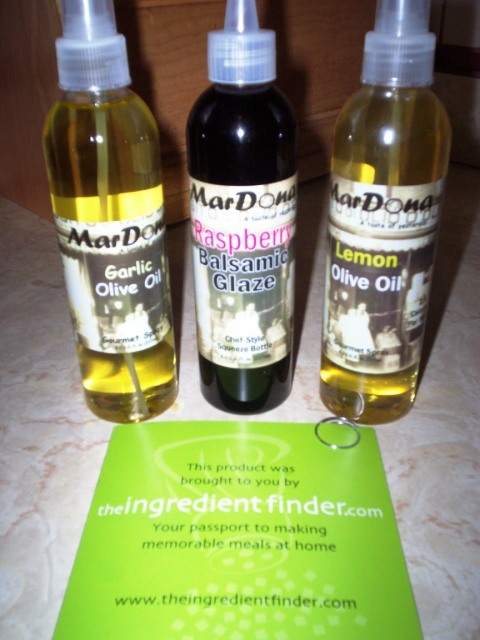 The great folks at The Ingredient Finder contacted us to see if we would like to view their website. Well, being interested in all things "food", we were happy to check it out. What we found was a whole new world of access to unusual oils, spices, grains, pastas, condiments, sauces and salts. Not to mention recipes, gifts, wines and exotic ingredients from all over the world. Need a spice from Africa? An oil from Spain? A grain from Tunisia? Well, the crew at The Ingredient Finder will help you find it. Besides the great recipes you'll find, you'll be able to fill your shopping basket with the most rare and delicious cooking essentials from the comfort of your home. Now you have no reason to tell your partner you just couldn't complete their favorite dish because of one "elusive" ingredient. It's all here. We were thrilled to receive a trio of oils to sample. 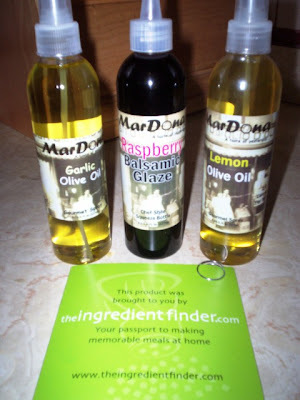 They were MarDona Lemon Olive Oil, which came in a gourmet spray bottle; MarDona Raspberry Balsamic Glaze, which was in a chef-style squeeze bottle; and completing the trio was MarDona Garlic Olive Oil, also in a gourmet spray bottle. Hubby can't leave the garlic olive oil alone. He's sprayed it on everything from roasted potatoes to his macaroni and cheese lunch, lol. It's definitely a superior product. The garlic does not override the gentle olive oil taste and it portrays an almost creamy texture. I can't wait to try the raspberry balsamic over vanilla ice cream (suggested on the bottle). The lemon oil will be pared with some chicken and served over pasta for what I am sure will be a tasty repast. On their website (see above), you will learn the story of how a group of fine home cooks came together to offer the kind of ingredients they couldn't find in stores. Now they are able to offer them to you. If you love to cook and are frustrated by a lack of unusual herbs, spices, oils and other ingredients in your local venue, then click on the link above to be carried to a whole new world of flavor. You'll be glad you did.